Many years ago I received this book, “Meditations on Mary”, by Kathleen Norris. Norris was a popular author at the time, influencing many of us with her books on life and faith. This book is filled with beautiful photographs of famous painting and sculptures of Mary. In the book, Norris offers meditations on the basic Christian teachings about Mary: as the Virgin, the Annunciation – when the angel Gabriel visited Mary and told her of God’s favor toward her, and the pending birth of Jesus to which Mary responded with beautiful poetic words that have become known as the Magnificat. Norris writes about the Incarnation, of Mary as the one who birthed God into the world in human flesh. The Greek Orthodox tradition calls Mary – Theotokos – God Bearer. Other meditations in the book include thoughts on the Assumption – when Mary ascended into heaven; the presentation of Jesus at the Temple; and thoughts on the Virgin. the greatest of all Christian saints. the daughter of Sts. Joachim and Anne. cousin of Elizabeth, aunt of John Baptist. Mary initiated the miracle at Cana, telling to Jesus to turn the water into wine. Mary was present at the Crucifixion in Jerusalem, and there she was given into Johns care. According to one tradition, she went to Ephesus. Another tradition states that she remained in Jerusalem. The belief that Mary’s body was assumed into heaven is one of the oldest traditions of the Roman Catholic Church. The feast of the Assumption is celebrated on August 15. The feast of the Immaculate Conception is not a celebration of Gabriel’s visit to Mary, rather it is a celebration of when Mary was conceived, and comes nine months before her birthdate, which is Sept. 8. Gabriel’s visit to Mary is called the Incarnation, although we tend to think of the incarnation as the birth of Jesus on Dec. 25. All-holy, immaculate, most blessed and glorified Lady are other terms people use to describe Mary. Mary’s influence has infiltrated India, a nation known for its reverence of women saints. Like other Hindu goddesses, Mary is viewed as a saint who will fulfill the aspirations of people and answer their prayers. People in India, Christians and non-Christians, pray to Mary for divine assistance when seeking a job, conceiving a child, or alleviating an illness. I am the bread of life, said Our Lord. From on high I came to earth so all might live in me. Pure word without flesh I was sent from the Father. One of the primary images of Mary portrayed by the Christian tradition is that of a poor, submissive, passive girl. This image has been used as a model for feminine virtue through the centuries, not a very useful model for real human beings. However, if one really listens to the story in Luke, one hears something quite different from Mary. She is brave and confidently takes on this task asked of her by God. She accepts the role of birthing God into the world, despite a very uncertain future in doing so. She stays with her son, God in the flesh, to the very end, despite the dangers of being at the foot of the cross where she too could have been crucified for treason just because she was there. This Mary is hardly weak, hardly submissive, hardly passive. Our readings this morning tell the story in reverse order. In place of the Psalm we have the Magnificat. This poetic piece is often sung and is one of the standard offerings in morning and evening prayer in the Book of Common Prayer. In the Gospel of Luke the Magnificat comes after Mary is pregnant, when she travels a distance to see her cousin Elizabeth who is about to give birth to John the Baptist. Mary and Elizabeth represent the miraculous way God breaks into the world – an old woman, long past her prime is about to give birth to a baby boy, a prophet who will pave the way for Jesus. Mary, a young girl is pregnant too, and she will give birth to God in human flesh. Both women are favored by God – not so much because they live exemplary lives, although they may have. Rather they are favored by God because they are lowly. In a world where human beings honor great leaders – kings and queens or athletes or movie stars, or artists or business people – God works in a different way. God works in unexpected ways and as a result sometimes the world is turned on its head. God has worked in unexpected ways in and through us, too. A few years ago we had no idea that we would help build a school in Liberia, create an exterior plaza that will be a welcome place of respite for humans and animals alike – not to mention a great social venue as well. We had no idea that we would become immersed in Blessings in a Backpack, feeding hungry kids on the weekends during the school year. We had no concept of a food pantry in the church nor of our ability to feed over 23 families on a monthly basis, And, although we have talked for years about increasing the wheel chair accessibility in the church space, we had no plan and no idea how we would do it. But in the last three years, God has stirred our hearts and inspired our spirits, and we are working on all of these, and more! As we come to the end of Advent, with Christmas just around the corner, let us give thanks for the in-breaking of the Holy Spirit. For in breaking through into our lives God helps us, leads us, guides us, in doing more than we could ever imagine. With God’s help we are able to make a difference, to impact the world around us, to transform pieces of this broken world and make them whole. For, as we learn from Mary, although nothing is impossible with God, God chooses to work in and through us, to bring forth God’s kingdom, here and now. 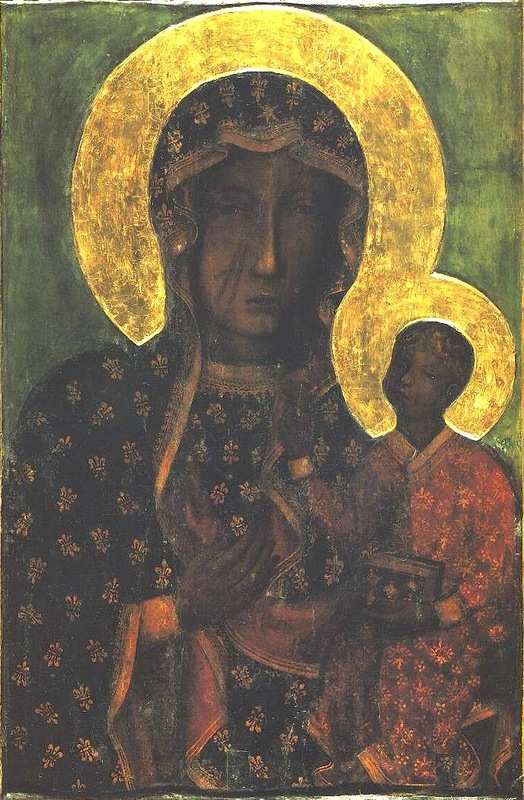 This entry was posted in sermon and tagged Advent 4B, Black Madonnas, Mary. Bookmark the permalink. I think it was that book that got me beyond what I had absorbed about Mary and began to see her for a woman rather than a saint.